I’ll shortly be leaving on a combination business and pleasure trip. Despite my high-tech job, I prefer comfortable traveling when I have time, so I’ll be taking Amtrak across the country. Yes, it can be done, and yes, it beats flying any day. Like a lot of small-business owners, it won’t be possible for me to disconnect entirely; I’ll need to be on call, and to have access to my work. But I want to carry as little as possible, and make the transition from the office to the train as painless as I can. Luckily, I’ve been taking advantage of cloud services, so preparing for this trip has been easier than those in the past. I recently bought a 13″ MacBook Pro (s aapl) at around the same time Scott did, but since I’ve been using a Mac mini as my primary machine for the past couple of years, transferring my data and settings to the laptop was pretty easy. For mail, I have several IMAP-based Google Apps and Gmail (s goog) accounts, and I was able to use the Migration Assistant to transfer my Apple Mail settings. It was actually easier to re-download the messages from Google’s servers than to copy several gigabytes of messages from the old mini. Similarly, it was easy to back up and restore calendar and Address Book settings; I did make an abbu file backup, then restore it to the new machine, since Apple includes some data that Google Contacts doesn’t. For IM, it was easy to copy Adium settings. For passwords, I had already set up Dropbox to sync 1Password data; as backup, I also use the cloud-based Lastpass. I use Xmarks to sync Firefox history, and I could have copied other settings too, although I chose not to, in order to do a little spring cleaning. Once I’m on the road, I’ll stay connected to the mini in my office through Apple’s Screen Sharing and to my company’s Windows servers through Microsoft’s Remote Desktop Connection. I’ll be using the Sprint Overdrive hotspot for connectivity, and although I’m sure that there will be places with no signal, Sprint has just activated 4G service in a couple of the places I’ll be. I’ll also be taking the Bookeen Cybook Opus e-book reader, which has grown on me since I wrote about it, and a Belkin surge protector/USB charger; Amtrak has pretty reliable power, but it never hurts to be safe. Of course, lots of things can go wrong, but I think that I’m pretty well prepared for my trip. So…all aboard! I’ll let you know how it goes. Amtrak image by Flickr user lazytom. Never mind all of that technology you just need a virtual assistant to take care of things for you! !then skype her for free. Who takes and actions your calls for example? I have 2 clients out on Motorbikes touring South America and its business as usual for them. I really liked your article, and it struck a chord with me since we are beginning to think about summertime and how our particular product will fit in with travel. One option you may want to consider for productivity while travelling is LogMeIn. We do simple, easy computer-to-computer remote access with apps for iPhone, iPad and Android. It’s easy to stay connected when your computer is on your mobile phone. Just thought I would throw my two cents in here. Here is how a modern setup works. Per, I haven’t jumped to the iPad, mostly because I prefer a physical keyboard. But I do use a lot of the other services you mention. It’s great that there are so many useful options available. I’ve always been intrigued by the thought of train travel, but it seems like it would be awfully slow. The few short trips I made took forever since the train stopped at every small town. How far do you travel by train and how long does it typically take? Dan, American trains aren’t as fast as those in Japan or much of Europe, but they are time-competitive with driving in many locations. And they’re much more comfortable than flying! Sorry for the dumb question, but how can I get my 1password up on dropbox? Love the idea and would like to access this great app on the road. Thanks!! I just went for a 4 day business trip, for which I had to use a replacement notebook. While on the trip I had to prepare a lecture and therefore needed a lot of data from office Desktop. My setup was much less complicated than yours. – Sugarsync.com for syncing my office iMac with my IBM notebook. This guaranteed that I had all my data with me, also new data are being synced back to my desktop (helpful in case your notebook gets damaged or is being stolen). Also no remote access to my office necessary. – Passpack.com for storing/syncing my passwords. Works online and offline. It’s free. – USB surfstick (G3/UTMS prepaid, it’s quite cheap in Germany when just used for few days). May I humbly suggest using Routefriend (http://routefriend.com) to plan your trip? It combines Amtrak with commuter rails and bus lines…essentially a Kayak for ground travel. This article provides a handy “checklist” for the products and services that allow a small business owner to take their work on the road. I’m not enough of a techie to know for sure whether it’s covered in this article – but online backup is another great tool. CPA Site Solutions, provider of websites for accountants, offers online backup to their clients. I’ve been impressed with the documentation about the service. 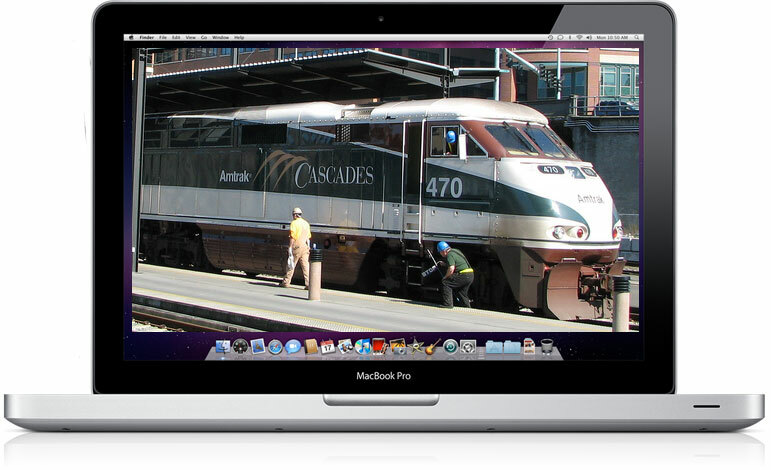 Consider online backup for those cross-country train trips. That way, if your laptop falls on the tracks underneath an oncoming train, you won’t lose any data.